Dr. Ketki Desai and Dr. Nathan Desai are pleased to be able to offer beautiful smiles to their neighbors in Hilliard and the surrounding communities. 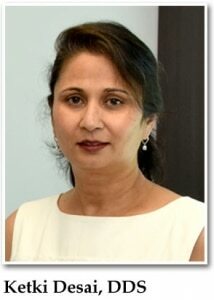 Ketki Desai, DDS, has been practicing dentistry for over 25 years. She has completed over 1,500 hours of continuing education to keep up with the high-tech, science-based transformation that has occurred in modern dentistry. She believes in building a foundation of trust through standards of excellence and a relaxing, positive experience for her patients. She strives to keep up with state-of-the-art dental procedures. Dr. Desai is the founding member of the American Association of Dentists of Indian Origin, and she maintains membership in the Columbus Dental Society, American Dental Association, and Asian Indian Alliance. She is also an alternate delegate and trustee of the Ohio Dental Association as well as a North East Regional Dental Board examiner. Governor Strickland appointed her to the Ohio State Dental Board from 2008 to 2012, and she served two years as the board’s vice secretary. She takes great pride in improving the quality of life and self-esteem of her patients and citizens of Ohio, and her commitment to lifelong education and quality dentistry ensures the highest level of care, both today and tomorrow. Dr. Desai and her husband have worked hard to raise funds for local charities such as Prevent Blindness OH, the Columbus Coalition Against Family Violence, and the Columbus Chapter of the Association for India’s Development at OSU. They are proud of their two sons, Neil and Nathan, and Dr. Desai is excited to welcome Nathan to the practice in the summer of 2015. 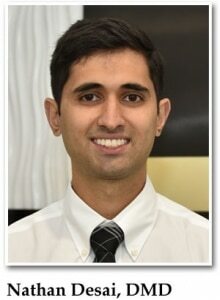 Nathan Desai, DMD, is originally from the suburbs of Columbus and attended Columbus Academy in Gahanna, after which he earned his bachelor’s degree in accounting at Miami University of Ohio. He has always wanted to pursue a career that allowed him to give back to his community. This desire and determination led him to pursue his doctor of dental medicine at Temple University Kornberg School of Dentistry in Philadelphia. There, he learned the art of dentistry and patient care from many of the best dentists in the country. Dr. Desai enjoyed his time in Philadelphia, but his heart has always belonged in Columbus. He furthered his training by completing a one year residency at The Ohio State University in which he treated many medically-compromised patients and performed IV sedation dentistry. He joined the practice part time in 2015, and has been full time since the summer of 2016. The doctors are excited to meet you and discuss your dental needs. Call our office today at (614) 771-6060 to schedule the first step toward your healthiest smile.